As part of our ongoing remodeling project of a rather cool 1978 contemporary house, the latest improvement has been a new exterior railings. Ideally this would have been one of the last things I would have chosen to work on, because they just aren’t all that interesting. I would much rather work on the fun stuff. A new bathroom, a new master suite, new carpet for basement, blah bla blah. And the list goes on . . . of what I would like to do. But as many of you know, we don’t always get to do the fun stuff, rather getting de-railed with the have-to-do things. Here starts the contemporary railing saga. Notice the ugly pipe railings on each deck and one across the slider in the middle. Like those cantilever decks? They had some of the first Trex decking on them too. This is a very cool house. It is well-designed… by an architect. Unfortunately, he wasn’t big on aesthetics. No poop brown thank you very much, and those railings are not what one would call cool retro. Gone-ski! After installing a new metal roof but before the snow fence accessories were installed on the roof we had a big, no huge snowstorm. All of a sudden the house began to shake, at 2:30 in the morning… it was the snow sliding off the roof. For fun, it decided to pull one of the railings off with it. 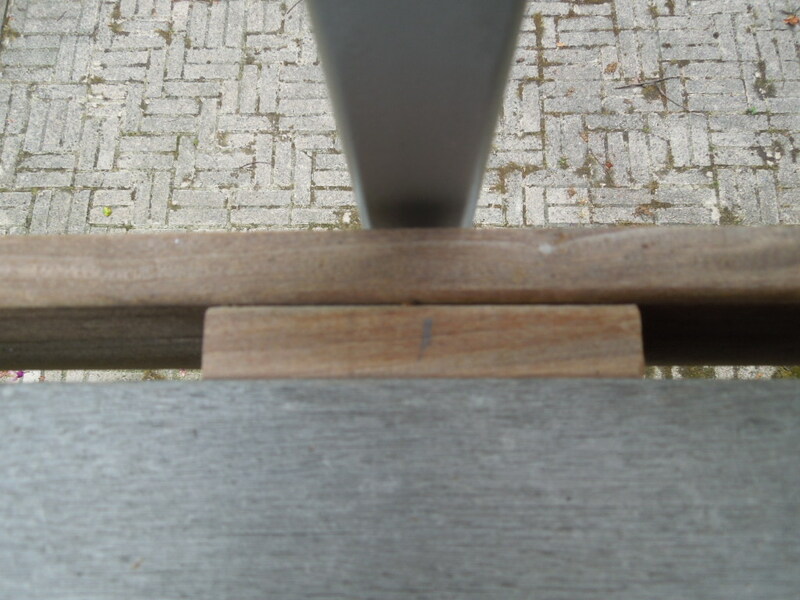 We later found out it cracked some of those beams holding the cantilevered deck too. The fun of homeownership! Fast forward to present day, all new Pella sliding glass doors, new Hardie Plank fiber cement siding (a dream material) and new decks. 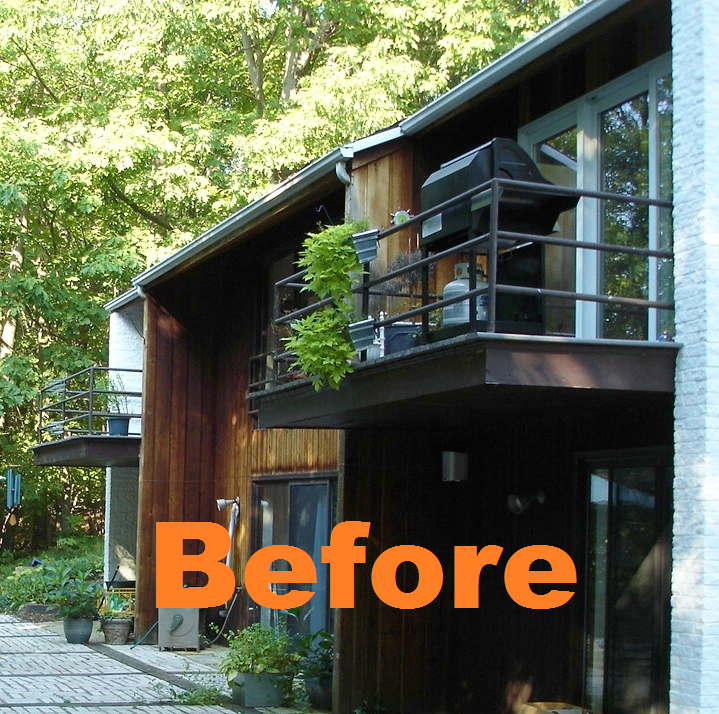 Yep, Trex is gone – too darned hot on the bare feet and plasticy, it has been replaced with Ipe hardwood decking. FYI: The Ipe is worth every penny, just as perfect as the day it went down three years ago and gorgeous. No splinters, no cracking, no warping, no bugs and a nice patina. Nasty brown has been replaced with nice soothing grays. Now . . . In order to maximize space on these small decks we wanted side mounted rather than deck mounted posts which would have eaten up space. 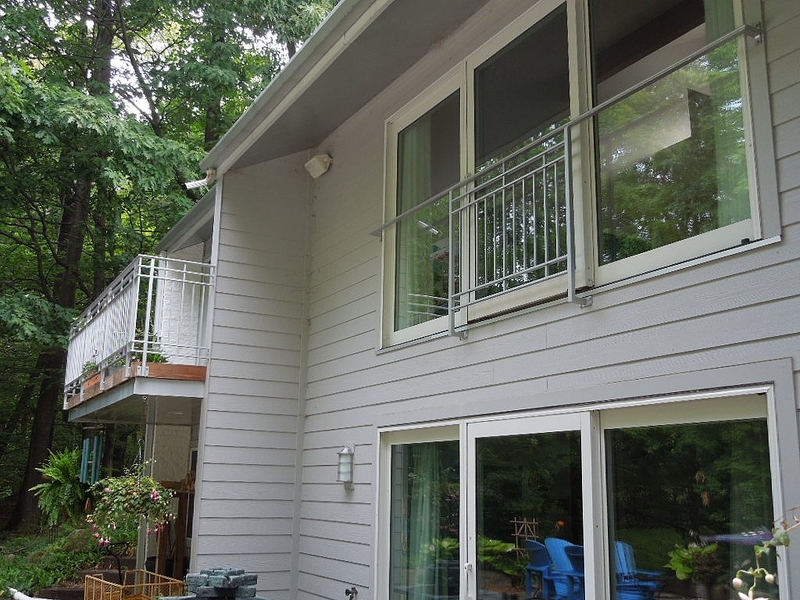 We waited to put this fascia piece on the decks until we knew what the railing posts would be and their required spacing. Yes, every inch of this was designed – no seat of the pants installation. As a designer this is what people pay me to do, think everything through first – then make it look good. Our decks required a spacer between the deck and fascia because the Ipe decking sits on an enclosed box: metal sides and underneath with an EPDM rubber covered top to move water from under the Ipe decking. The design is as much about aesthetics as it is engineered to shed water. 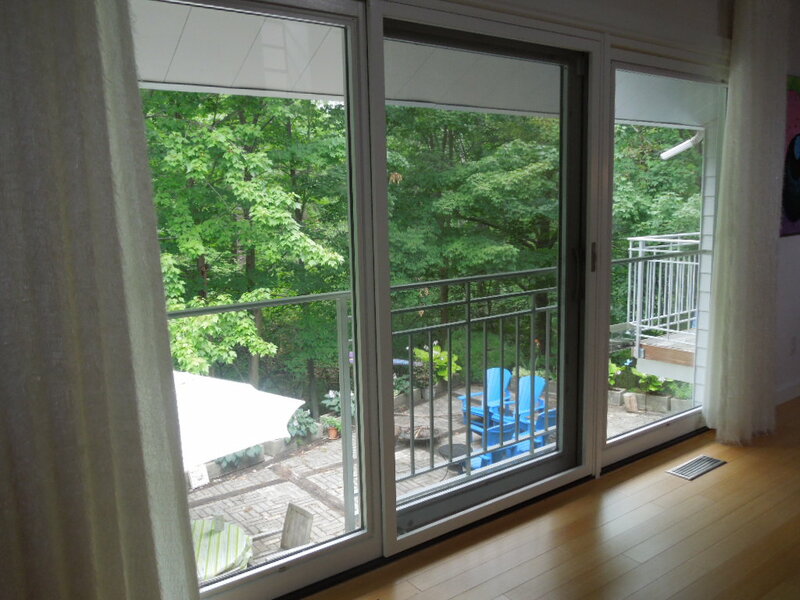 No, there will never be a deck in front of this slider, it would blow the whole view to below, but we like a big wall of windows. Visibility is key. However, it has to provide safety. So, yes, a railing is required. At the very last minute it occurred to me why have the railing running the entire width when only the center section opens. No reason other than it is what people normally do. “Just because” is never a reason in my book, so I revised the drawings with big “X’s” on the two sides. A huge improvement from the first picture huh? Part of what took so long was deciding what railing to use. Our first choice was Cable Rail because it took up so little space visually. But as small as they are they are not inexpensive and all those little parts plus stringing all those lines add up in labor costs. I also thought I liked horizontal rather than vertical lines. But again this costs more because of how the metal railings are fashioned. Like I said in the beginning, railings just aren’t that interesting and on this contemporary home they shouldn’t be. The railing is there because it has to be. It is not a design statement or focal point, therefore our railing needed to be visually unimportant (and meet code requirements). So as unimportant as these are, they look good and feel good from the inside. Check the box, another item finished. The whole terrace is yet another thing. For more from Lisa Smith and this on this house, see her author’s page. Among her exterior renovations, check out Those Are Plants, Not Weeds on My Roof. Great look, love the mission style rails! Had to laugh when I saw the red arrow – love it! 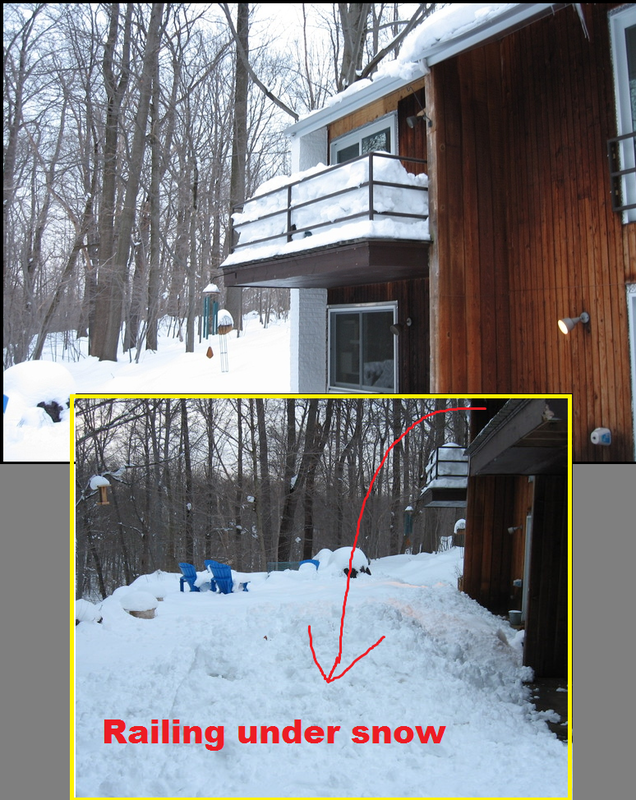 However, as a former home owner in Pittsburgh, I must say, I do not miss the snow and all the havoc it causes. Gray is a great color for your house by the way, against the backdrop of all that green. Nice work! Thank you Donna! Ha, you mention the gray… it was a bit of a trial & error. First time they came and put them up, I went outside and said “that is brown not silver.” There is lots of silvery metal to coordinate with. 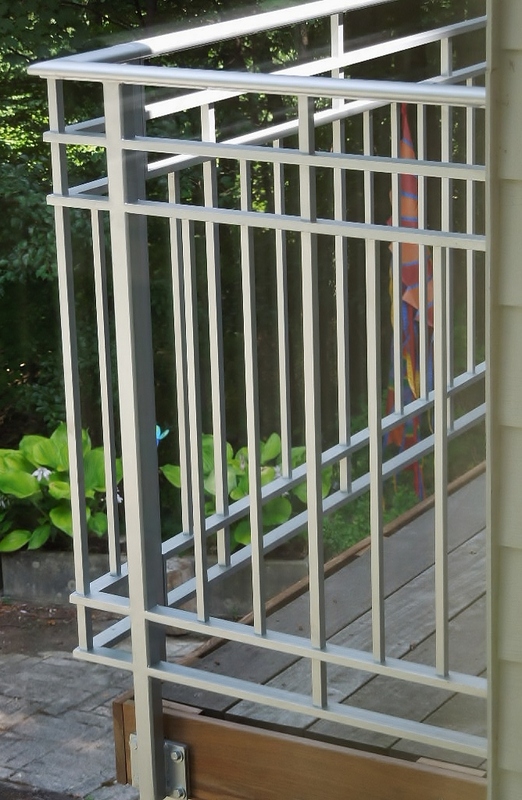 I very kindly told the fabricator, “as much as I love the railings and your work, I don’t want to see them.” They were so nice and took what was up, down and everything else back to the shop to be recolored. You know how it is, color has to be right. Thank you very much. Ahh, the grill… a future project (years away) the outdoor kitchen. Awe thanks! We are really pleased with it. Gives the decks a cosy feel -even from the inside.